Last week I conducted a very informal survey, asking my (non-app developing) friends their opinions about mobile apps. While I’m not 100% surprised by their answers, I was surprised at how strongly they felt. Some tough words for the mobile app world. However, if you’ll notice, each comment is only about apps they’ve deleted or had a negative experience with. What these responses don’t tell you is the apps that stay are so integrated into their daily life they barely notice them. And in the app development and business world, that’s a honey pot. Over the past six years, the best mobile apps have literally become extensions of our lives. Whether it’s checking weather, reading the news, or purchasing groceries, the apps with staying power are so necessary and so well done, they become an everyday tool. Businesses with successful mobile apps have a level of connection with their users that mobile friendly websites can’t quite attain. A survey conducted by emarketer.com shows app users spend more than triple the amount of time in apps versus mobile friendly websites. Just imagine what that level of engagement can do for your business. But before you dive in head first, you need to ask yourself: Is a mobile app a good fit for my business? 1. What problem can my mobile app solve that a mobile-optimized website can’t? For retail, if you have repeat customers, you can personalize the checkout process by storing data and making purchasing as easy as one click. For healthcare, you can store their medical data in one place, allowing users to find the info they need without having to navigate online. For banking, you can install push notifications to alert the user to a low balance, etc. Really, the list is endless, but you need to find where your unique niche is and make the benefit so irresistible your target market can’t live without it. 2. Do you have a lot of frequent visitors or repeat customers? Mobile apps are ideal if you have people who are using your services a lot. The trick is understanding how they are using your services so you can streamline and simplify their user experience. Mobile apps are also excellent ways to foster rewards programs and build community. If you already have loyal customers on your website, a well-designed mobile app will most likely be warmly received and probably even celebrated. 3. Who is your demographic? While the right mobile app is ideal for any age, a younger demographic usually contains more early adopters and is easier to convince to spend money. According to a report by www.comscore.com, 64% of millennials have purchased a mobile app. 4. Can you use or enhance the functionality of your user’s phone? The most loved apps take advantage of the built-in technology of a smartphone. Social media apps integrate the use of the camera and photo sharing. Banking apps use the camera to capture and deposit checks. Health and fitness apps use the phone’s GPS to track mileage for runners and bikers. Home and construction apps use the phone’s accelerometer as a level. Navigation apps use Siri commands so users can operate hands-free. By using the phone’s functionality, your mobile app extends the functionality of users’ smartphones. Of course mobile apps couldn’t exist without smartphones, but without great apps, smartphones wouldn’t be nearly as valuable to to consumers. 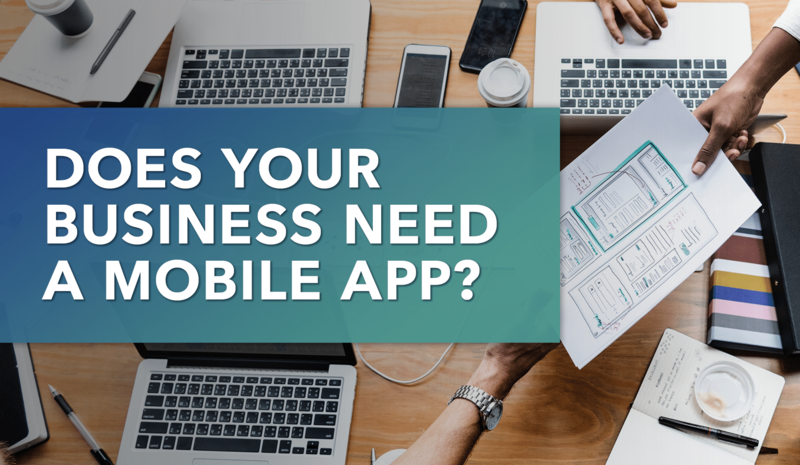 In the end, if you can answer these four questions with clear, enthusiastic answers, there’s a good chance a mobile app makes sense for your business. The key, however, is partnering with an app development team that can help you build a rock-solid business plan for your mobile app. At Five Pack Creative, we believe a mobile app is only as strong as its business plan. To achieve your maximum ROI, we’ll work closely with you to refine your plan and set you up for success. If you’re still not sure what a mobile app can do for your business, check out our article on the 5 Benefits of Building a Mobile App. If you are ready to discuss the steps to creating your mobile app, click the button below to schedule a free consultation.